This collection of lesson resources supports students to design and build using VEX IQ kits, whilst learning about VEX IQ parts, programming the controller and key engineering terminology (such as chain drive, friction, gear ratio, motors). 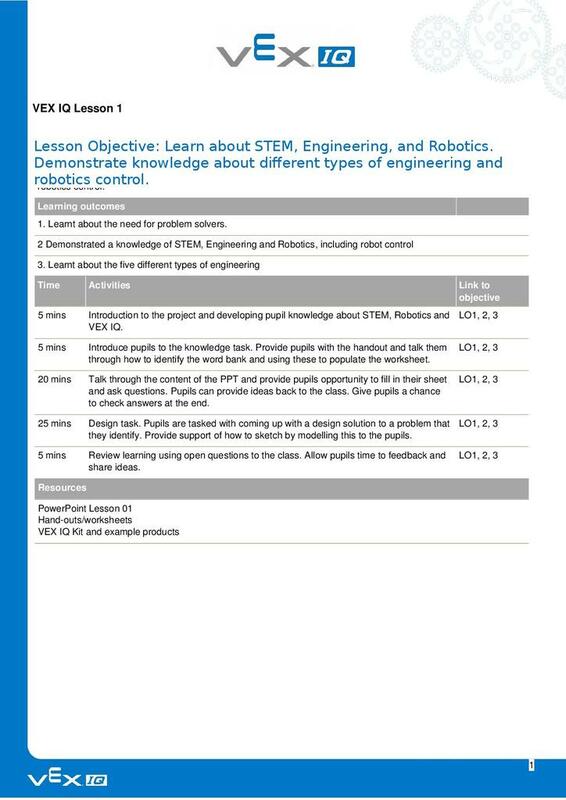 The challenges and learning are based on a US STEM curriculum map, but have been converted to a UK format for the delivery of up to date and modern Design and Technology for primary and secondary school. 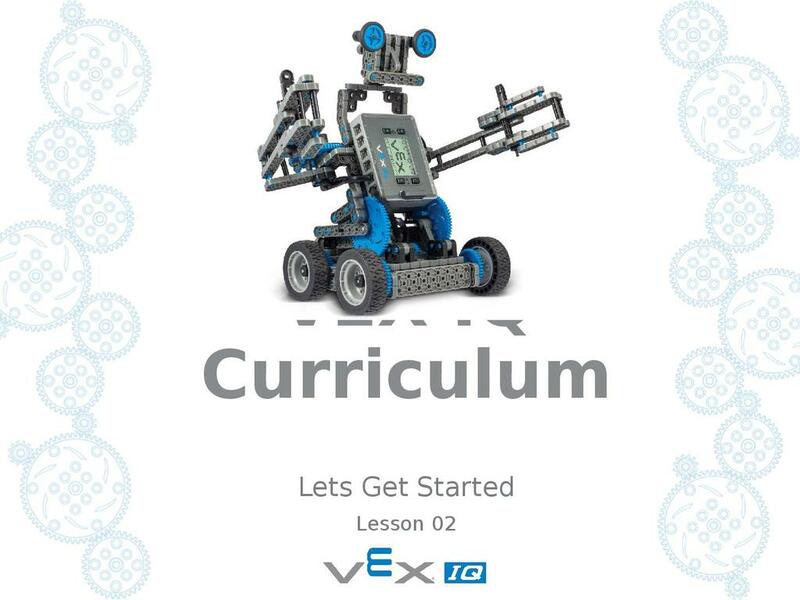 Lesson 01 – Develop an understanding of STEM, Engineering and Robotics, including robot control. Lesson 02 - Recognise VEX IQ hardware parts and components visually, learn about what the parts do and pair Controller with the Robot Brain. 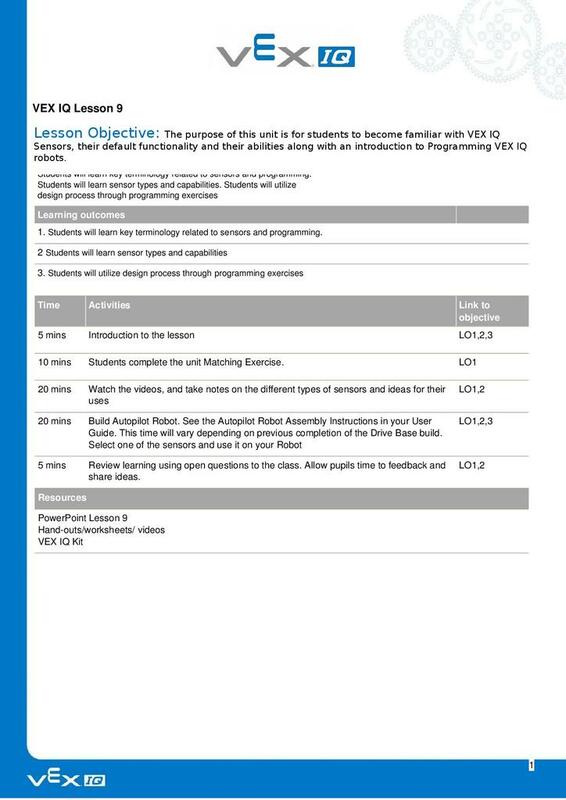 Lesson 03 – Follow instructions to build a functional VEX IQ robot, and troubleshoot and solve problems to improve design. 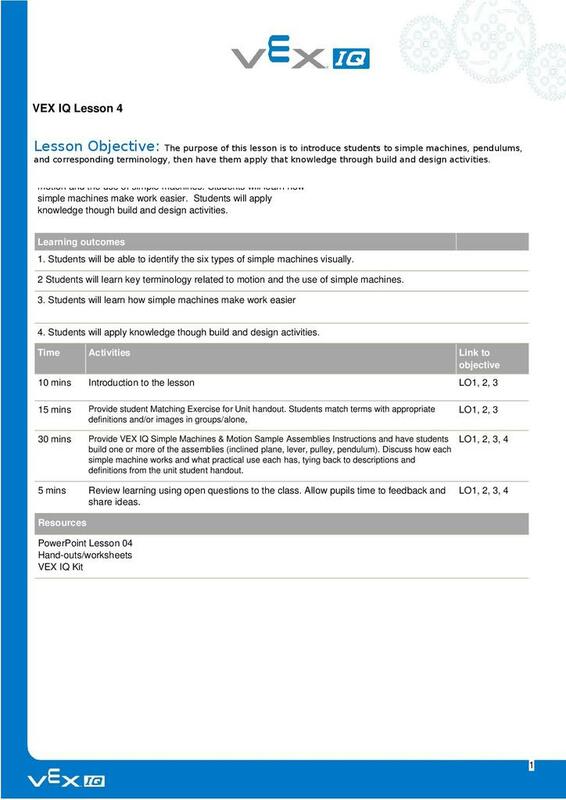 Lesson 04 – Learn key terminology related to motions and simple machines. Apply this knowledge through build and design activities. 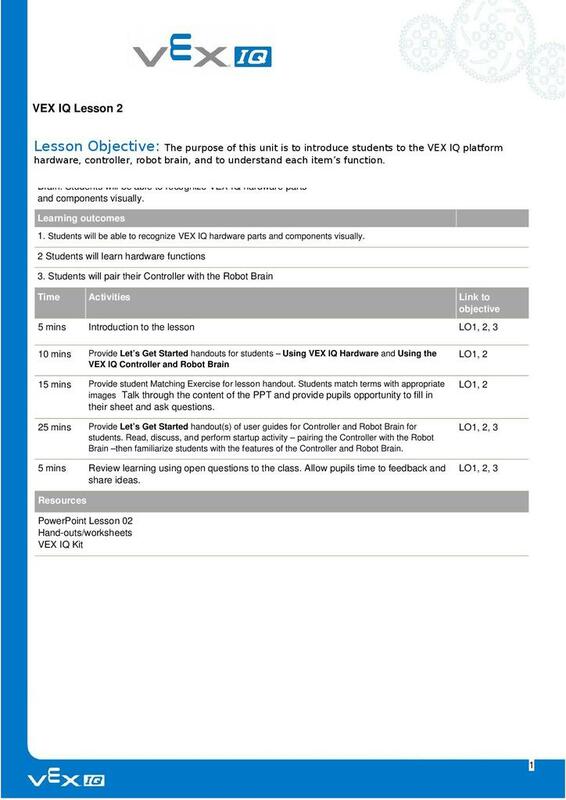 Lesson 05 - Learn key terminology related to Chain Reaction Devices. Apply knowledge of Simple Machines and Pendulum. 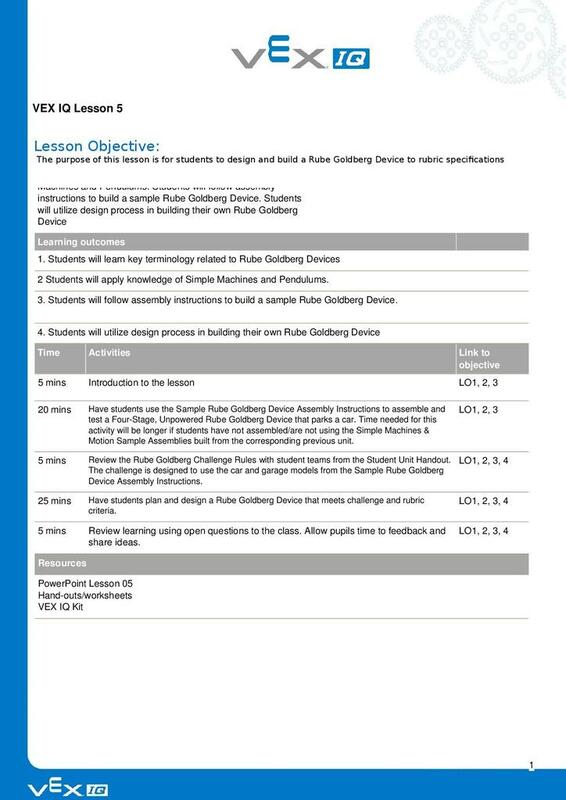 Follow assembly instructions to build a sample Chain Reaction Device. 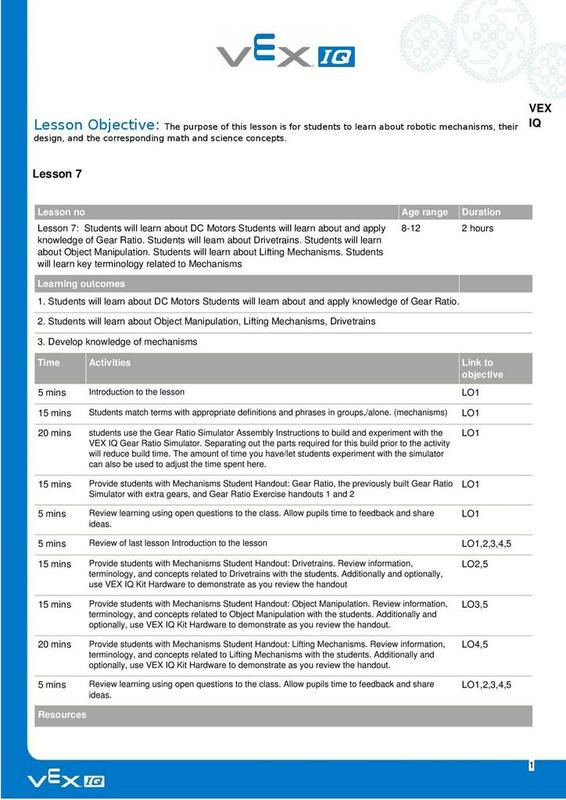 Lesson 07 - Learn about DC Motors and apply knowledge of Gear Ratio. Learn about Object Manipulation, Lifting Mechanisms, and Drivetrains. 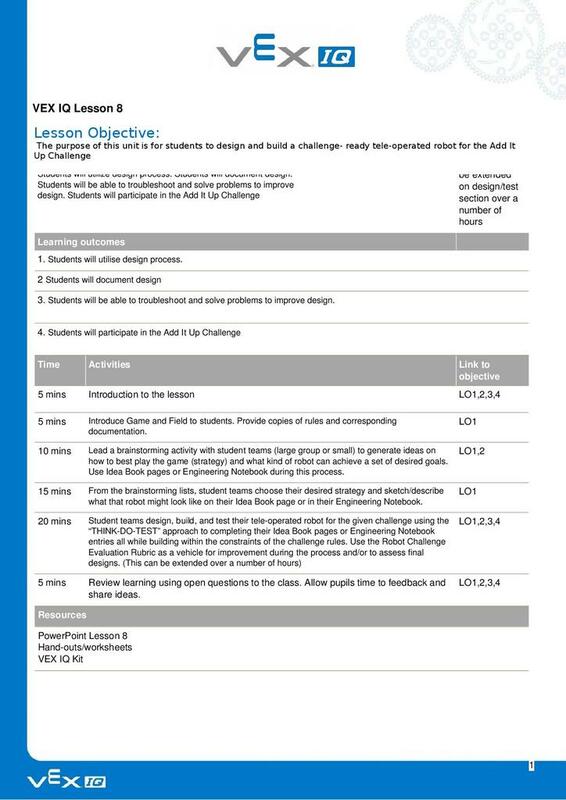 Lesson 08 - Utilise and document the design process, troubleshoot and solve problems to improve design, and participate in the add up challenge. 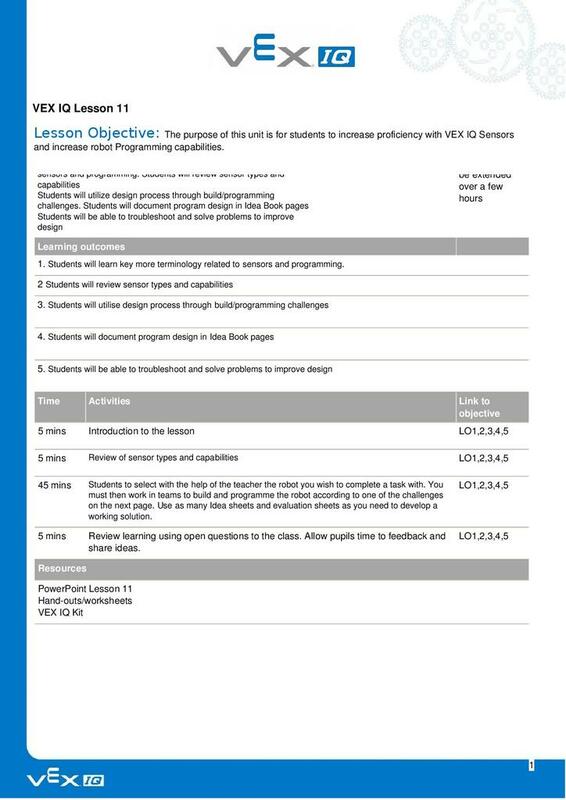 Lesson 09 – Learn key terminology related to sensors and programming, learn sensor types and capabilities, and utilise design process through programming exercises. 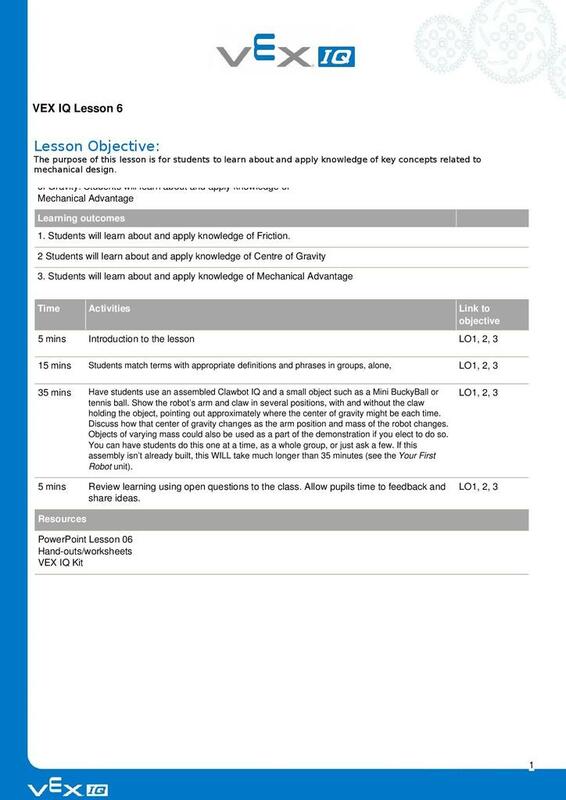 Lesson 10 - Apply knowledge of Simple Machines and Pendulums. 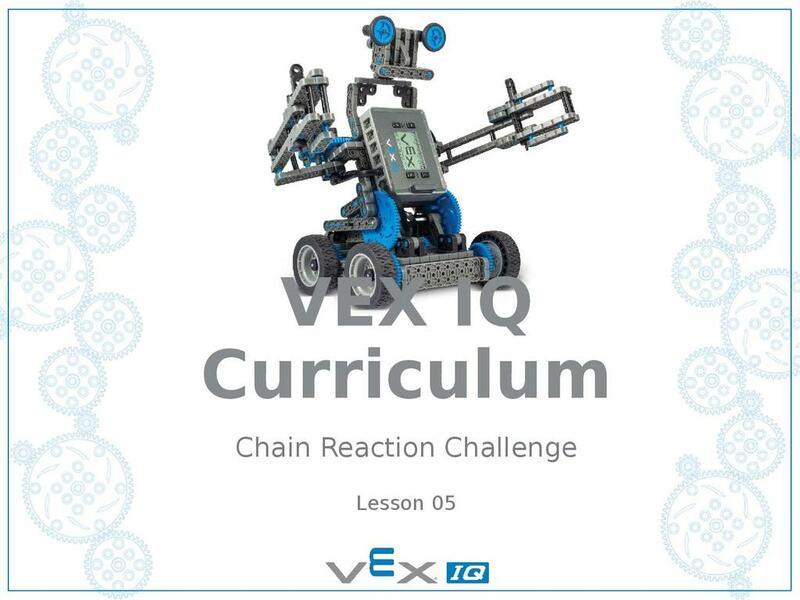 Review terminology and the design process in building their own Chain Reaction Device. Apply knowledge of VEX IQ sensors as well as programming techniques to improve the design. 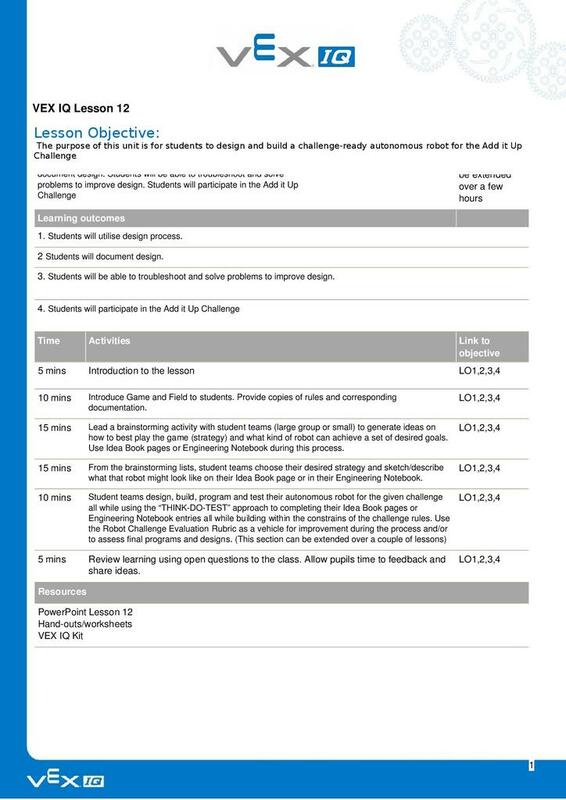 Lesson 11 – Work in teams to build and programme and robot to complete a task using problem solving and by reviewing sensor types and capabilities, design process, and programming challenges. 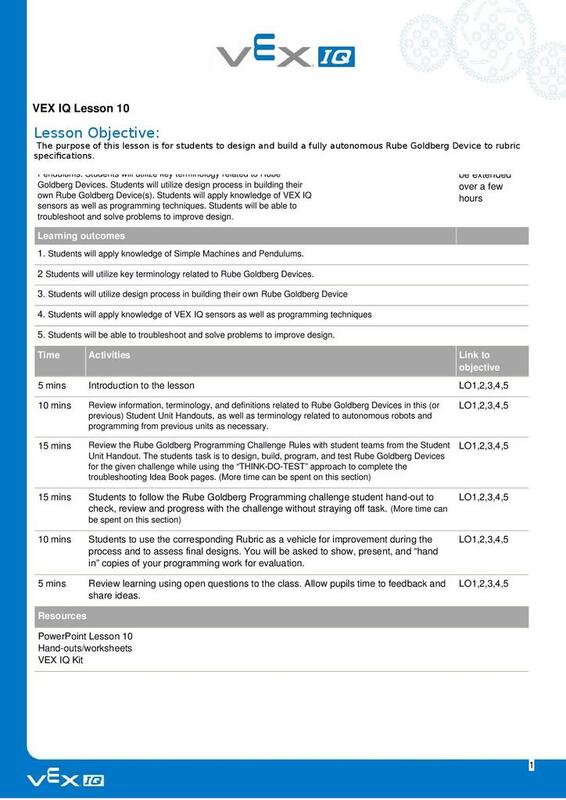 Use trouble shooting, and problem solving skills to improve the design. 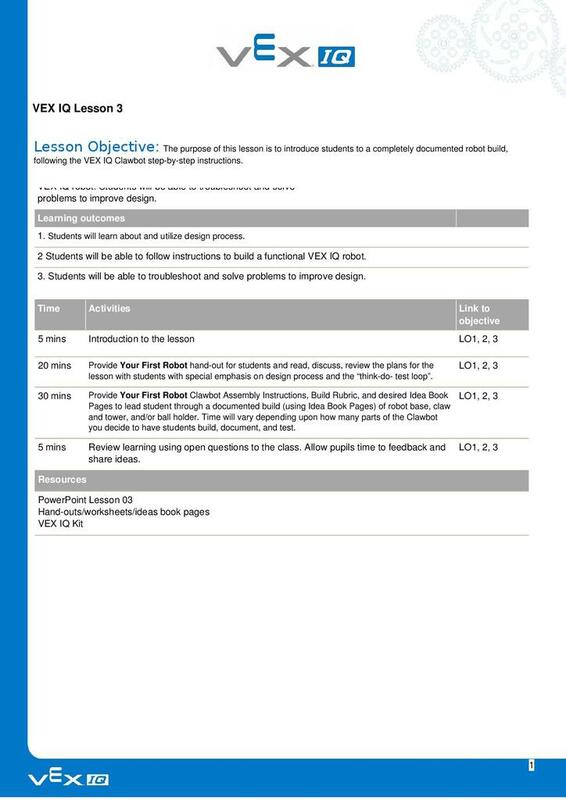 Lesson 12 – Review and document the design process.